The owners: Delia Phillips, a fashion buying director, and her husband Scott, a senior project director, live here with son Jay, 13, and daughter Amber, nine. The project: Grade II-listed pig barns that were converted in 2000 to create a four-bedroom home. When couple Delia and Scott Phillips viewed the barn conversion for the first time, they were immediately attracted to the remote location, tucked away from the main road, not overlooked by the neighbouring properties, and with outstanding views across farmland. ‘Despite the rustic, dark interiors, we could see the potential for transforming the property to create large, light, contemporary spaces,’ recalls Delia. Find out how they got on, then browse more of our real home transformations. Considering taking on your own renovation project? Our guide to how to renovate a house is full of expert advice and information. Buying the barn privately meant the sale went through smoothly, as the couple could liaise with the owners directly, and they moved in six months after the first viewing. They began by updating the property; ‘Scott and I did all the decorating ourselves, painting and wallpapering over the walls and updating every room,’ says Delia. After four years of living in the barn and seeing how they used the spaces, the couple decided to tackle the kitchen. ‘It’s a large, sociable room, so we wanted to maximise this by adding a central island with bar stools and a sofa for relaxing on,’ says Delia. The biggest challenge the couple faced was finding the right company to deliver the floor finish they wanted over such a huge area. After a year of research, they finally found Luxury Coatings, which specialises in commercial spaces. With three-quarters of an acre to look after, the couple had to do most of the landscaping themselves, including the formal courtyard in the centre of the barns, where they removed all the existing planting, reshaped the grass areas and beds, rotated the soil and removed hundreds of agricultural stones. Recently, the couple employed the services of landscaper Hendy Curzon and had a new patio area built to connect the house with the paddock, which includes sunken seating and a pagoda. Delia and Scott inherited the suite from the previous owners and updated the space with slate floor tiles. Delia had the Lily wallpaper specially reprinted from Cole & Son’s archive. 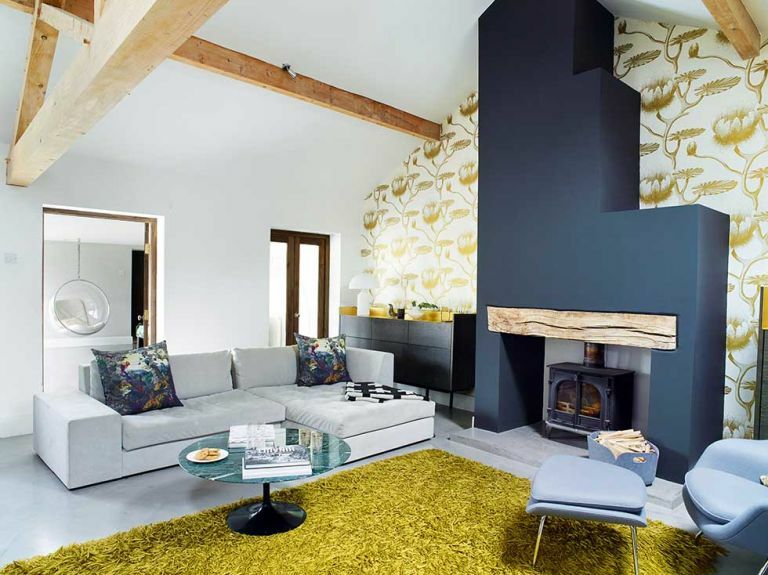 It’s the perfect backdrop for an otherwise contemporary space, with mustard accents tying the scheme together. A concrete plinth is flush with the garden room floor, creating a seamless flow from inside to out through bi-fold doors. Delia and Scott landscaped the formal courtyard garden attached to the Grade II-listed former pig barns, and planted a mix of trees and shrubs. With views across the courtyard being the main focus, the room is kept minimal. Looking for more renovation advice and inspiration?